Conveniently, before I became a mother myself, Mother's Day was not all that important to me. I know how horrible this sounds and it is no reflection on my mother. I have an incredible mom and wonderful life in large part due to her. What I mean is that I always sort of brushed Mother's Day off as a Hallmark Holiday. Sure, I would give a card and a gift. But there wasn't a huge emphasis on the day itself in my family. I remember as a younger, know-it-all version of myself thinking that it was stupid. After all, you should love and appreciate your mother EVERY day of the year, equating it to the person who only goes to church on Easter. This year, I see that this day is so much more. Whether it is a Hallmark Holiday or not, how lovely is it to have a set day each year to pause and show your appreciation for your mother? In the hustle and bustle of every day life, so often we don't get the chance to show or say just how much we care. My mom has been such a pinnacle in my life. In the past (again as the aforementioned younger know-it-all), it was easy to focus on her shortcomings. "Remember when you forgot to pick me up from school?" Ugh, what a brat. The bad situations stick out more prominently in our minds naturally because they were more traumatizing and impactful. Luckily, back there in my memory bank, I can also recall the fact that she would write me notes in my lunchbox telling me she loved me... with the lunch that she made me. She would cut my sandwich into shapes with a cookie cutter. She would pick me up early from school just for no reason other than to surprise me. Today, seeing her with Charley and how great she is gives me a glimpse into how she was with me at that age. I am so grateful to her for everything she does for us and I am now appreciative to have this day to pause and show her. The other side of Mother's Day that I never realized before now is that it is also a time for us as moms to pause and reflect. Today I was awakened by the sound of Charley babbling over the monitor and couldn't help but laugh to myself. I usually let her talk to herself for awhile before going to get her but today I just could not wait. The way her face lights up as soon as I peak my head into her room makes my heart full. Even now as I write this, tears are welling up in my eyes because I know how lucky I am. I created this incredible, perfect little person that is starting to turn into a pretty awesome human being. And she is all mine. Before her, the single thing that I wanted the most in my life was to become a mother, and now being her mother is the best thing I have ever done. Yes, it is challenging, tiring, filled with worry and angst, but it is also the most rewarding experience in the world. (Okay, enough with the superlatives.) I am 100% confident in saying that there is not a single thing I would change in the way I am raising her, and that feels pretty great. So although I tell my mother I love her every day of the year, today I pause and make sure she knows just how appreciated she is. I reflect on the good memories that get lost in the fog of decades of time. 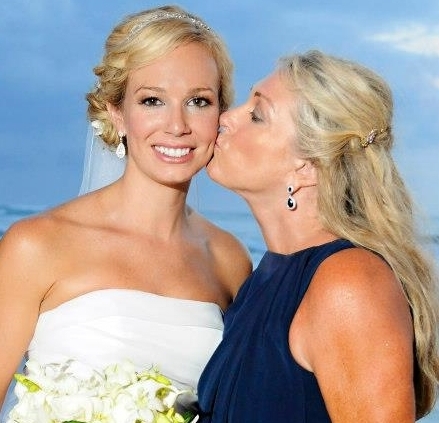 Without my mom, I wouldn't have had such a drive to become a mother myself and for that I could never be more thankful. I also reflect on my own short journey of motherhood on this day. I am constantly in awe of my daughter: her easygoing demeanor, her vivacious personality, her beautiful spirit. Today I can take a little credit for all of that. All I can hope for is that someday when she is older and knows everything, the way I once did, she is able to remember and appreciate the little things like cut-out sandwiches and lunchbox love notes.